Both these platforms have their own specialties and are different from each other in many aspects. We are here elaborating all the essential information related to the AngularJS and Node.JS. Moreover, we are also showcasing the difference between these platforms, by which you will be able to understand them more deeply. Let us move forward and have a closer look at these technologies. 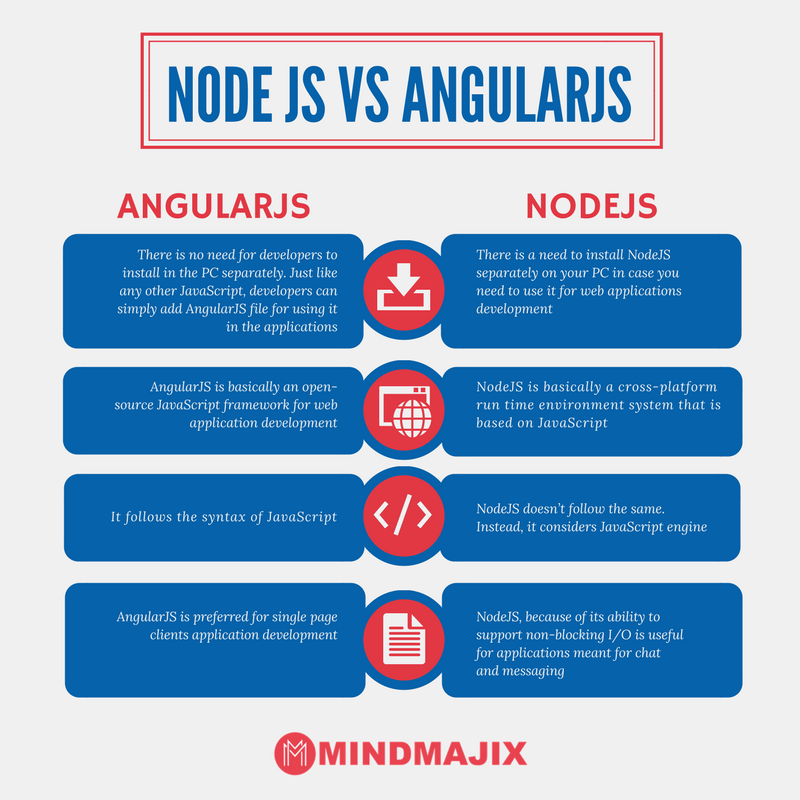 What makes AngularJs easy to use than NodeJS? MVC (Model View Control) Framework: AngularJS is blessed with a dynamic and easy to use Model View Control Architecture and that makes it easier for the developers to develop a client-side web app. Easy To Use: It decouples the DOM manipulation from your desired app logic, which makes it an easy to use framework. MVW (Model View Whatever) Architecture: It also comprises a Model-View-Whatever architecture and is entirely eligible to other partners such as Model-View-View and Model-View-Controller mode. The view manipulates and modifies DOM to update the behavior and data. Want To Get AngularJS Training From Experts? Enroll Now For Free Demo On AngularJS Training. Scalable: The NodeJS applications are scalable in two ways, i.e. Horizontal and Vertical, and that can help you in improvising the performance of your application. Unit Testing: It comes with a ravishing Unit Testing feature. By using its JS unit testing frameworkssuch as Jasmine, you can easily test your developed code. Server Development: Node.JS is blessed with in-built APIs to make different servers such as TCP Server, DNS Server, HTTP Server, etc. Open Source: Node.Js is entirely open source and is free to use worldwide. You do not have to pay a single penny to use or extend it. Both these platforms play a very important role in the field of development. However, we also know that they are quite different from each other and have their own specializations. Let us compare both the platforms in terms of different features and see how these technologies play different roles. Take a look at this below-mentioned table to get all the details. Web Framework It is a web framework, which means it can be used to automate common development tasks while developing a variety of websites, web apps, applications, web application framework, and web services. You can not use Node.JS as a web framework, however, you have an option to choose from a variety of frameworks based on NodeJS such as Hapi.JS, Socket.io, Meteor.js, Sails.js, and Express.js. Installation You don’t need to install AngularJS in your system to use it. You can simply embed the AngularJS files in your code base just like any other JS file. You will have to install NodeJS in your system first while making a development environment. Important Features It allows you to use HTML as a template language. With the help of AngularJS, you can express different components of a web app by extending the HTML syntax. Apart from this, AngularJS also makes the development of single page and dynamic web apps easy by offering features such as scope, directives, data binding, dependency injection, deep linking, routing, filters, and templates. It offers an array of features to develop networking and server-side applications. You can easily simplify the development process of video streamlining sites, single-page websites, and similar I/O intensive web apps with the help of it. Furthermore, you are also free to use a single-threaded event mechanism and asynchronous APIs while improvising the code execution speed in NodeJS. Now, this is a kind of interesting but easy question. Let's do not rush out and have a detailed explanation about it. A working website has three core parts, Front-end, Back-end (Server), and Database. AngularJS performs all of its operations in Front-end part of a website, while NodeJS entirely plays on the Server side. Both of these technologies also work together to make a website successfully working. Now, coming to the question, working on AngularJS is way more easy than NodeJS. You can easily perform all the tasks and work required to showcase your data on the Front-end part of a website. However, for working on the server, you need to hustle with logics and connections and that is somehow a bit difficult to just showcasing things. So, we have our answer here, which will guide you towards an appropriate choice. Now, as we have studied about both the platforms and are completely clear about their functionalities and differences. In a single line, we can say that the AngularJS is associated with front-end, whereas Node.JS is associated with back-end or server. However, both the technologies work together in a completely working website. Apart from this, we have also discussed about the convenient to use language. Now, it is entirely up to you what choice you make. All the very best! Explore NodeJS Sample Resumes! Download & Edit, Get Noticed by Top Employers!Download Now!